2/3 cup of white rice (130 calories), 3 oz. of lobster sauce (100 calories). I swear, this is last of the lobster sauce hahaha. What a sad sad spring break. I sure wish I was off vacationing somewhere and eating fun foods instead of this leftoverfest and being holed up in my room all week. 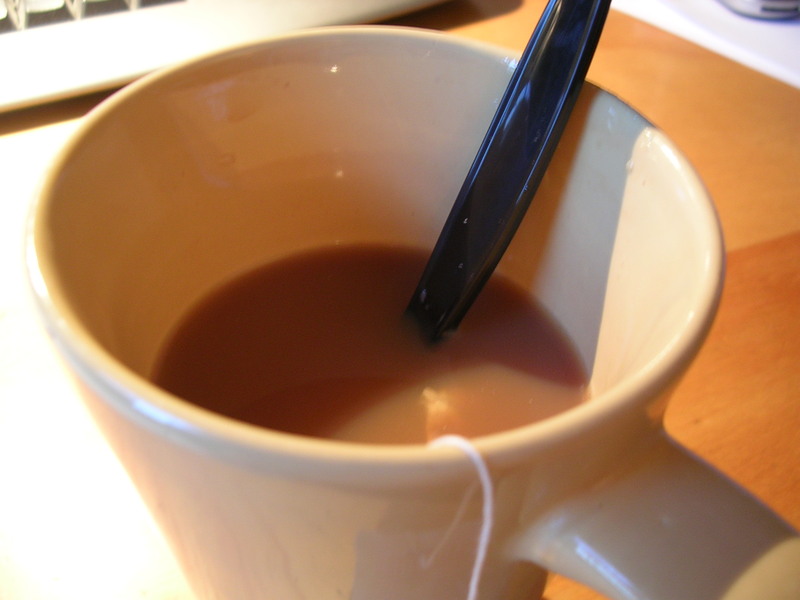 1 cup Lipton black tea (milk tea style, 20 calories). I steeped a Lipton tea bag in hot water, but I generally don't like the flavor of tea by itself, nor do I really like the watery sweetness when there's just honey added. So I poured a little bit of nonfat dried milk powder into it, along with a little honey, to make it into sort of a milk tea. Tasted much better that way. I'm not a big fan of tea, but I've always known that it's good for you, so I'm trying to make an effort to incorporate more of it into my diet. That plus the fact that I could sure use the caffeine to keep me focused on my studying, since it's so boring and overwhemling that I always want to just crawl into bed and nap lol. 14 seafood dumplings (580 calories), 3 tbsp of hoisin sauce (150 calories). Last time I made seafood dumplings my boyfriend complained that they were too fishy, but this time I thought it tasted just fine. The filling has pork, napa cabbage, shrimp, and shitake mushrooms in it. I think the flavor is pretty nice, it's not as strong as regular pork dumplings, plus it's healthier than the straight up meat dumplings. I don't understand why some people insist on calling these gyoza, because that term is only applied to Japanese dumplings, where in actuality, dumplings between the Asian cultures really don't differ much at all. I do, however, make a definite distinction between dumplings, wontons, and the Americanized "potstickers". The difference is all in the skin, because the fillings are literally infinite. Dumplings have a thicker, starchier skin than wontons, but they have a soft chew to them when cooked, and compliments the filling. Wontons have those practically breaking off, tender skins that are slippery and sometimes mushy. 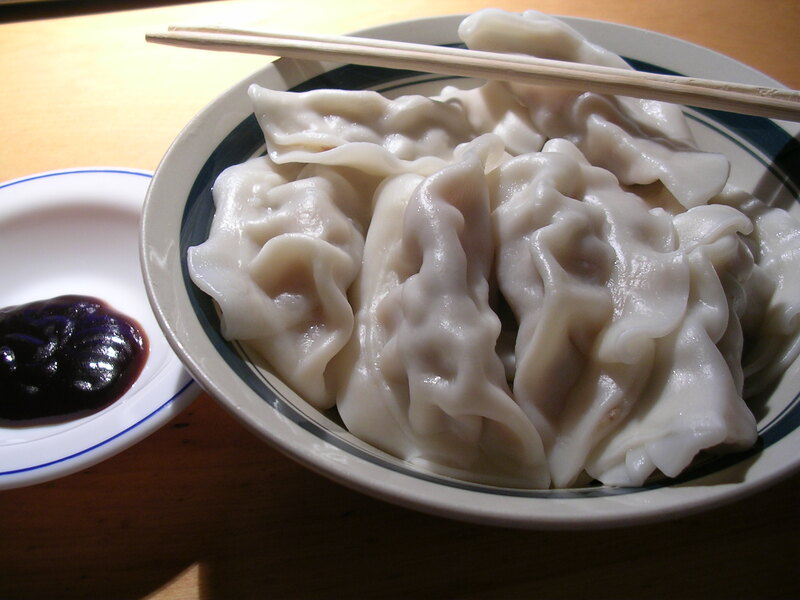 The skins of wontons basically fade into the background to give way to the flavors and textures of the filling. Now potstickers, first off, are cooked differently, since they are pan fried. But potstickers have the thickest, chewiest skin of all three, since it is made from the same kind of dough that is used to make steamed buns. Have you ever noticed that the meat filling of a potsticker is quite small compared to the bulk of the skin? The potsticker is generally eaten for its pan fried skin, and the meat inside is merely flavoring to compliment the dough. Speaking of potstickers, it reminds me of a famous Shanghai dish called 小笼包 "xiao long bao", or also known as Shanghai meat buns. The Chinese name for it literally means buns in bamboo steamers, which is exactly how these buns are made. They have a meat filling, and when the dough for the skin is wrapped around it, the maker usually adds a small ice cube inside. When the buns are steamed in a bamboo steamer, the ice cube melts and the meat filling's juices combine with the liquid to form a super savory pocket of soup inside the bun, waiting for you to bite in and spill into your mouth. The skin is also made differently, using some glutinous rice flour, so it has a chewier texture than dumplings. These are absolutely divine, especially when you get them fresh in Shanghai. Mmm. Now I want some of these haha. Handful of lightly salted almonds (~10 nuts, 70 calories). I didn't really have anything else to eat, and I was craving random stuff, such as sweet snacks and meat. Figured I probably just needed something to fill me up. And these babies really do the trick. Total for today is about 1150. It's below the lower limit, but I'm about to go to sleep and I am already full from the almonds. It's okay though, after yesterday's food-fest I'm sure I had more than enough calories to make up for today lol. This entry was posted on Friday, March 30th, 2007 at 12:18 am	and posted in beverages, Chinese, fruit and nuts, seafood, snacks, Uncategorized. You can follow any responses to this entry through the RSS 2.0 feed. I am taking the MCAT next Saturday (the 7th)… so this is like super crunch mode for me now heh. And yes, I am hoping to be a doctor in the future, though I don't know what type yet. Thanks for the wishes!